This is my fifth, year-end roundup of in-progress and in-action images from my studio and of my pots, plus a workshop image for good measure. It’s fun for me to look back on the collection of images I’ve shared, and reflect on what’s continued from past years and what was new in 2015 for me as a maker (lots!). These are just a selection of favorites I posted throughout the year on my Facebook and Instagram. As with past years, it’s not an order, it’s a cycle. This is my fourth, year-end roundup of goings-on images from my studio and on the road as a workshop presenter, and this year, Visiting Artist. It’s fun for me to look back on the collection of images I’ve shared, and reflect on what’s continued from past years and what was new in 2014 for me as maker. These are just a selection of favorites I posted throughout the year on my Facebook and Instagram. As with past years, it’s not an order, it’s a cycle. It’s enjoyable to put together this annual, year end pictorial of images from my studio of in-progress and new work, as well as artist goings-on, and reflect back on both 2013’s newness and continuations. These are just a selection of images I posted throughout the year on my Facebook page and now Instagram too. As with last year’s, it’s not an order, it’s a cycle. I’m delighted to have work in a very unique show at this year’s NCECA, Houston conference curated by ceramic artist, professor, and color guru George Bowes. He invited 18 clay artists to participate, and paired each of us with a specific building in his city of Galveston, TX to use as inspiration for a completed work. The Dwelling on the Gulf: Ceramic Artists Respond to the Architecture of Galveston exhibition takes place at the Galveston Historical Foundation from March 9-28, 2013 and is on the bus tour for NCECA. You can read more about George’s thoughts on the show and see a couple more in progress pix by participating artists here. My assignment was the Lemuel and Julia Burr House (c. 1876), which has a “mixture of classic, gothic, and Italianate styles, and is attributed to Nicholas J. Clayton, Galveston’s leading 19th century architect.” Pictured above is ‘my’ house; drawings I worked up contemplating the house as a pot, its form and deco; leatherhard, in progress; and finished. Participating artists include: Peter Beasecker, William Brouillard, Joan Bruneau, Kristen Cliffel, Deirdre Daw, William Edwards, David Eichelberger, Carol Ann Fer, Julia Galloway, Bill Griffith, Suze Lindsay, Kari Radasch, Louise Rosenfield, Judith Salomon, Richard Shaw, Aaron Sober, Holly Walker, and myself. For those who are attending NCECA in Houston, come cheer me on as one of four headlining demonstrators! In addition to the Dwelling exhibition, I also have work available at the Houston Convention Center Gallery EXPO with 18 Hands Gallery, opening Tues eve. And a place setting at Santa Fe Clay‘s La Mesa Exhibition at the Holiday Inn Express Downtown. Both are open during the conference, March 20-23. For those who are unable to attend, no worries! I’m already stocking up my online Etsy shop with new work before I go here, and have upcoming workshops scheduled you can check out here. Hope to see you, and thanks so much for the support! More than half my sketchbook is made up of gathered images, making my sketchbook as much an idea book as a place to draw. Collected images, often mashed-up and flipped around, have become an important part of my process and influence to my work. When I teach workshops, I usually pass out my last sketchbook because I think it is just as important to see how an artist develops an idea (the origination of a form, texture or sensation) as it is to see a demonstrated technique. 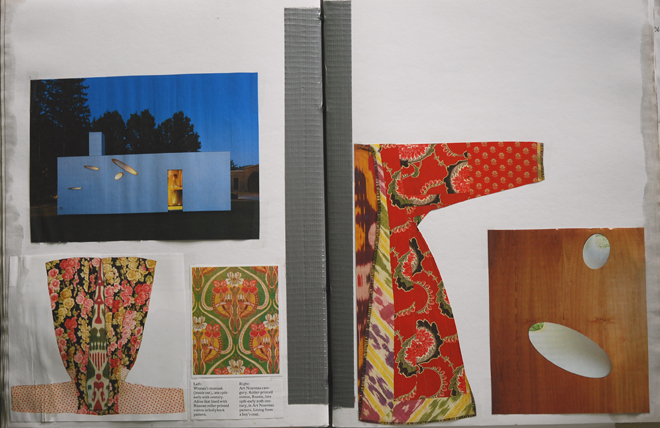 I gather images from all over (magazines, catalogs, museum pamphlets, postcards, etc.) so it’s hard to know where an image came from or when, and while I’ve gotten pretty good at noting what is in the image, sometimes there are lapses, so if it’s not noted now, I didn’t note it before. 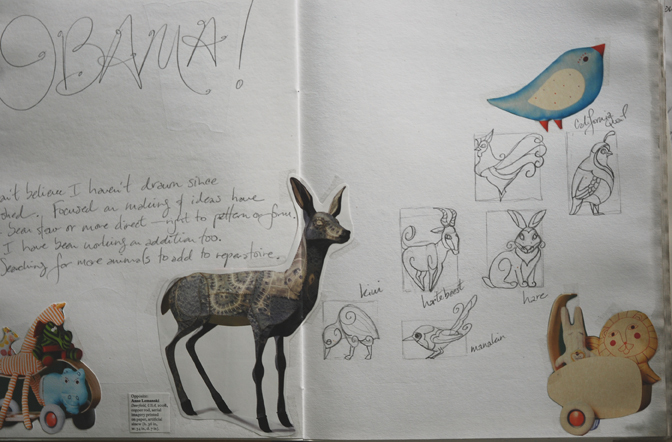 First row: This is my current sketchbook (’08-present). 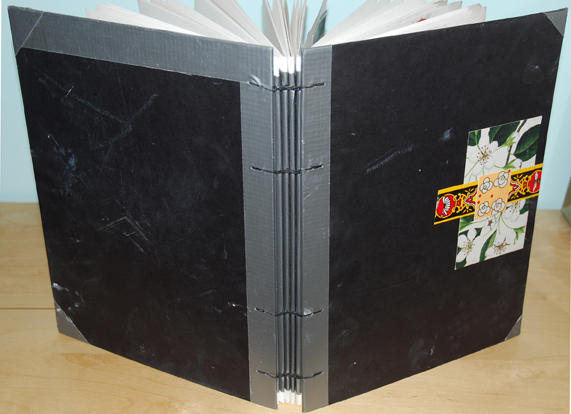 I made it using coptic binding, sewn with black waxed thread, allowing it to sit flat when open. I use duct tape to strengthen and protect the corner edges and signatures for studio use and travel. The outside is collaged with sections from soap boxes. The second image has pictures of women’s and boy’s Russian munisak robes from late 19th to 20th century mixed with architectural details from a contemporary home. I put these disparate images together because I liked the highly ornate from one time period next to the minimal of another, and both carry ideas for pottery deco. Second row: This first image is a mixture of writing and animal drawings of mine for stamps, collaged with animals from a catalog and Deerfield, a sculpture by Anne Lemanski. 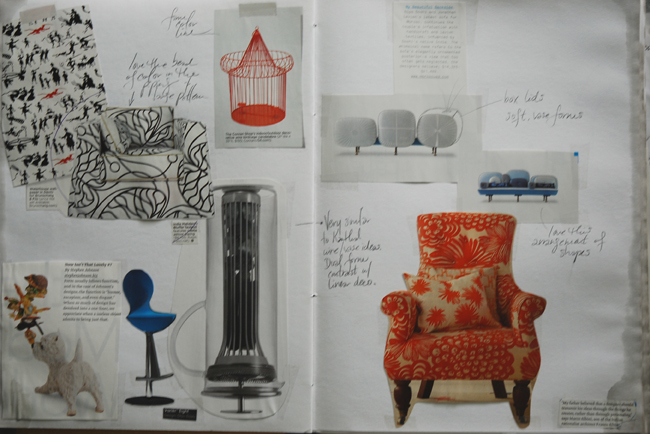 The second are notes I jotted next to a variety of industrial design objects and furniture I find influential for form and detail, including Devils wallpaper by Waterhouse for Brunschwig & Fils; Bluffer fauteuil by India Mahdavi for Ralph Pucci; wire birdcage candelabra by The Conran Shop; Variér Eight chair by Olav Eldøy; Now Isn’t That Lovely #7 sculpture by Stephen Johnson; and My Beautiful Backside couch by Doshi Levien for Moroso. Third row: The left image is a pairing in textures. I love the negative space in each, but I mostly enjoy the dense texture that creates each shape: Light of Tomorrow sculpture by Mimura Chikuho and Welcome the Cube black jacket by Giles Deacon for Fay. The second image is a collaged influence mixture of manufactured china by Calvin Klein, Paola Navone, Royal CrownDerby and Royal Copenhagen with a photograph I took of a painting in a window storefront in Berlin. 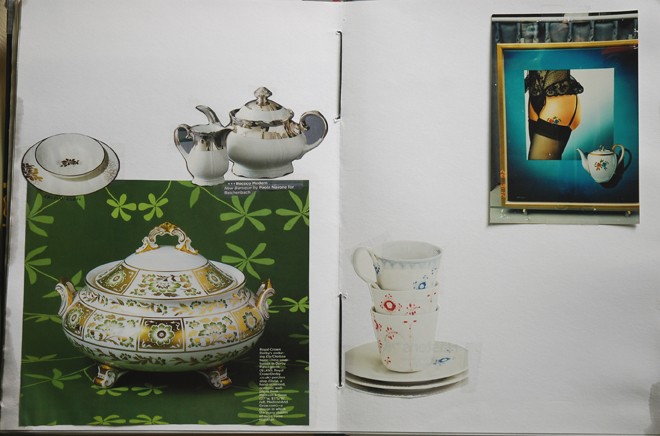 Fourth row: In the first image, the first page shows the dining room in Donatella Versace’s Milan apartment with murals of Chinese vases and jars on the walls. 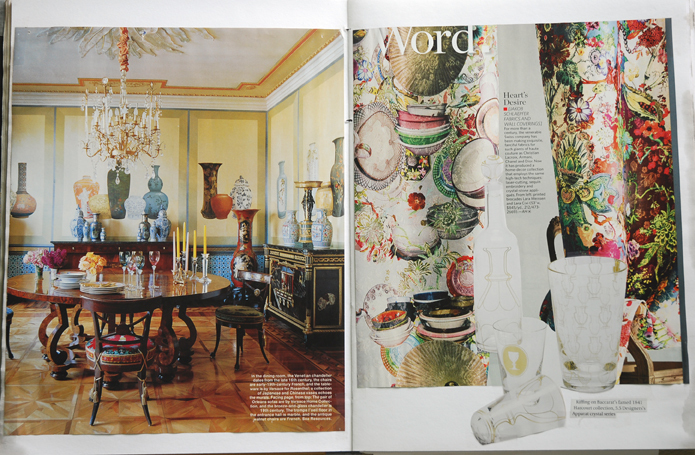 The second page is a collage of fabric and wallcoverings by Jakob Schlaepfer with Baccarat Apparat crystal cups and decanter by 5.5 Designers. On each page, I like the layering and the “real” mixed with its 2-D version. The second image shows my affection for lighting as influence. 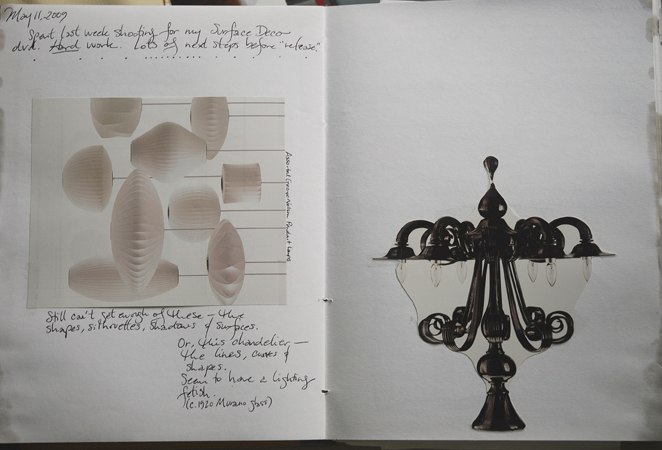 I have both these George Nelson pendant lamps and this Murano glass chandelier (I love the other colors it comes in too) in two different sketchbooks, I like them so much. They are purposefully flipped sideways and upsidedown to suggest other forms. Fifth row: The first image is actually an old pairing I use in my slide presentation and had on my studio walls for years. 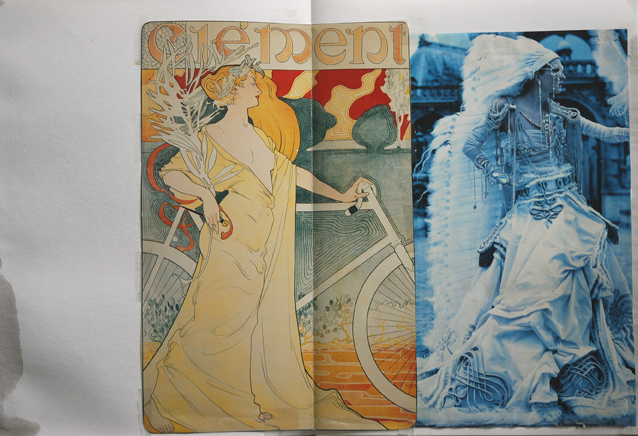 I put the two together because both Art Nouveau advertising images and Haute Couture clothing are influences, and because their stance and gesture are remarkably similar. 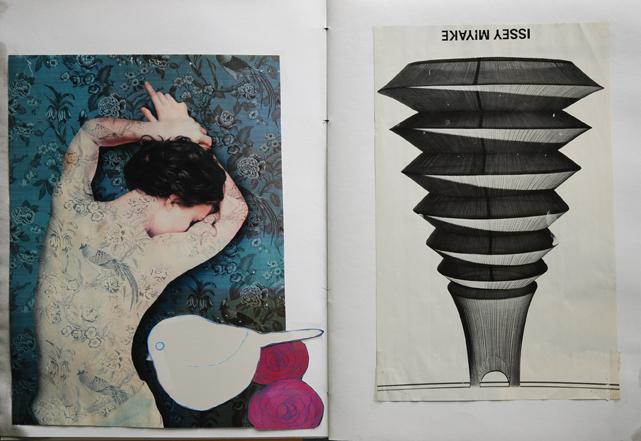 On the left page of the second image is a magazine ad with imagery that becomes tattoo-like, collaged over with a bird I cut out from a friend’s card. The layering and suggestion is something I would like to have in my work. 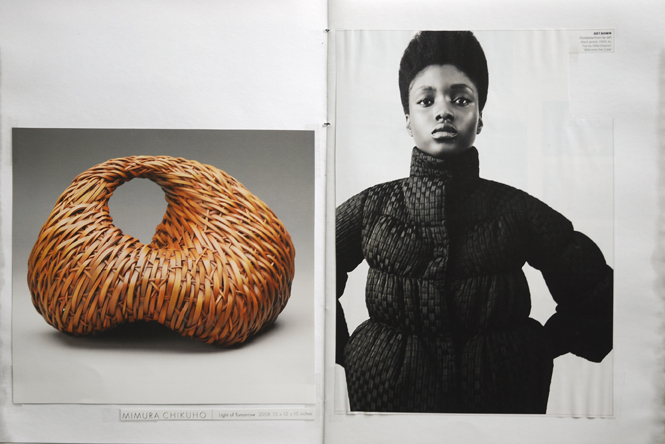 The right-hand page is also a very old magazine ad that has been on various studio walls and in my slide presentation. I purposefully taped this upsidedown to change the context from a couture Miyake dress to the silhouette of a footed vase with striking shadows and pin-stripes. A reminder to play and change my perspective. Last row: The left image features two well-known characters and actors. 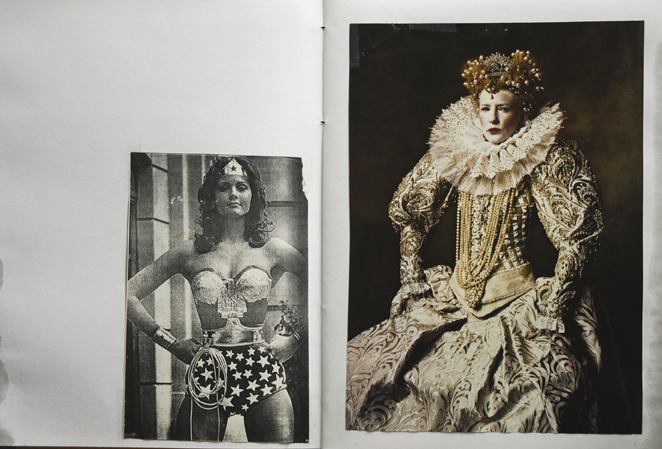 The costume/dress of both Wonder Woman (a childhood hero of mine) and Queen Elizabeth have been influences because of their decorative and structured forms. The contrast and similarity of these two pictures of strong women is both humorous and striking. The second picture is another interesting pairing that I have titled “yummy” in my mind. The shapes are curiously similar, but what I appreciate in each is their very different take on extravagance, decadence and compound form. 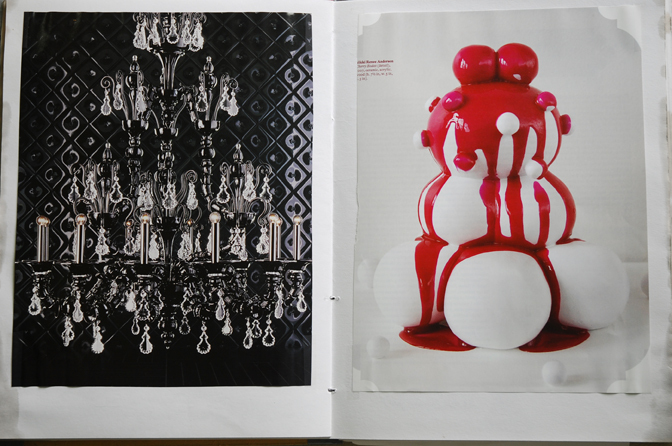 A crystal chandelier on the left and a sculpture detail of Cherry Bodies by Nikki Renee Anderson on the right. PS: A hazard of having a glass of (red) wine while doodling in your sketchbook is a spill that results in wrinkled and lavender-tinged page edges.